Rated R: for all the weaknesses of flesh (and how it tears between teeth). Originally published in the Sirens anthology by World Weaver Press. L. S. Johnson lives in Northern California, where she feeds her cats by writing book indexes. She is the author of the gothic novellas Harkworth Hall and Leviathan. Her first collection, Vacui Magia: Stories, was a finalist for the World Fantasy Award. Her novel remains vexedly in progress. 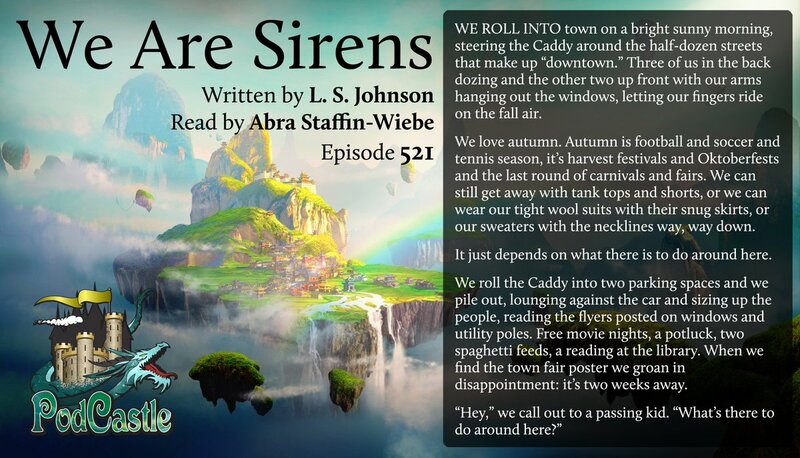 Abra Staffin-Wiebe loves dark science fiction, cheerful horror, and futuristic fairy tales. Dozens of her short stories have appeared at publications including Tor.com, Escape Pod, and Odyssey Magazine. She lives in Minneapolis, where she wrangles two small children, three large cats, and one full-sized mad scientist. When not writing or wrangling, she collects folk tales and photographs whatever stands still long enough to allow it. Go to aswiebe.com to discover her fiction about fluffy pink murderbears, firebirds bearing gifts, and other things beautiful and bizarre. This was beautifully written and I thought the cracking of the voice from "we" to "I" was really nicely done. Not sure about the implied binary of "everyone either crashes or changes" though. loved Sarah, was really squicked out by what I perceive to be transphobic sirens. Yeah, I understand they dislike her cuz she won't join their we, and I heard transphobia in "We're coming to get you Sarah-girl." After all the rest of the story says they've meant ppl of all genders throughout time without batting their collective eye. I really enjoyed this story, it was unique and not at all what I expected to begin with. I have fantasies similar to the Siren's MO, especially after I've just read about another beaten woman or watch an episode of "The Handmaid's Tale". This reminded me a lot of the "Succubus" short from the V/H/S anthology movie. Whatever Sarah became, I'm betting on her in the coming duel. Hi Jen, yes I agree that sirens are generally despicable beings however I just listened to the story again last night and there attitude toward trans characters is really inconsistent. I guess I just felt it was weird for them to understand about descendents of hermaphroditus and or intersex people in the past and then for them to say something like yeah there's no doubt doubt about it sarah girl is def a boy. but I suppose if they were generally despicable people then there inconsistent attitude toward trans people makes sense. Can anybody help explain to me what made the sirens turned to stone and how they escaped the stone? Fascinating how this one converts the male gaze into empowerment. I'm not Fenrix, but my take on it is: if you want men to look at you or desire you and take steps to make that happen, it would be empowering when they do. I don't think this is a rare situation. harrietpodder, I think the author was very clear that Sarah was a girl and the sirens thought of her as female in her core. How should the author have worded the reveal that Sarah was trans? The sirens didn't hate Sarah for being trans. As you mentioned, the story said they had met with many others in the past and had no problems. They hated her for being unpredictable and having a sense of self which they couldn't corrupt. They hate Sarah for a part of herself which runs deeper than gender or sexual orientation. I think the sirens turned to stone as punishment by Hades for failing to complete their task. Somebody was able to cheat their test (I'm not sure exactly what they were testing though, especially if no man can resist them). They escaped the stone by vibrating it with their song until it cracked. The sirens were terrible, but they were also cursed. After becoming sirens, they had no choice but to perform their songs. I think the sirens' only moment of choice came when they gave into their anger and hatred and allowed themselves to become sirens in the first place. I feel sorry for them because they have no chance at redemption or hope of peace. They can only follow their compulsion to kill or be punished for failing to kill. Yes, and compound this with it being their primary mechanism of ensnaring their prey. thanks, all. I don't really know how the author "should have" worded Sarah being trans. I think it was the way they repeated "girl" mockingly that annoyed me. I felt that they were being inconsistently transphobic even allowing for their general evilness but you are right; Sarah's transness coulda been handled much worse. thanks for the responses re the male gaze.